What about Abraham?! Ha! Gotcha, Jesus. Abraham was a good and righteous man. Everyone knows he kept God's Word. But he died, just like everyone else. Jesus, are You trying to say that You are more important than Abraham?! 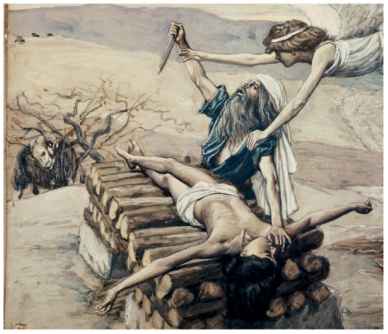 Why, Abraham was definitely the greatest man ever! He did not spare his only son, but offered him up when God commanded it. And God blessed him with so much wealth, he had to be doing something right! What about the prophets?! Yeah, Jesus! They died too. Are you saying that the men whom God sent to preach His Word did not keep it? You know that these Jewish leaders were wrong in trying to lie about Jesus, and twist His words. You know the irony of them sticking up for the prophets, when many of their people persecuted and even killed the prophets of the Lord. What about Jesus!? He obviously, and perfectly kept His Word. And yet He never was blessed with tremendous wealth or exercised great earthly power. And He died! Well, yes. He died in the physical, bodily way. The temporal way, here in space and time. But it was not an eternal spiritual death. It was not being permanently and eternally cut off from God, as one who has rejected Him. "Never seeing death," here, is talking about not going to hell. Not enduring eternal death and separation from God, on account of rejecting Jesus Christ. What about you?! Have you rejected Jesus? Do you keep His Word? Careful, now. Be honest. Every single day you mess things up. You fail to do what He commands. You might do a good job in other people's eyes, but when judged on a scale of perfection, you come up short. You are in the same situation as these men testing Jesus. Deep down, if you are honest, you hear Jesus talking and saying that you will die if you do not keep His Word, and you want Him to stop talking. "Be quiet, Jesus. Those are not the words we want to hear. Stop it. You are being too exclusive, Jesus. There are a lot of really nice people who do good things, even if they don't believe in You." Really? No. They may seem to be nice, and their actions and words may look good, but if not done in faith in Christ, they are empty and still lead to death and separation from the Lord. And your defending them means that you are straying from Jesus and His Word, as well. And so you are drifting from life in Christ, to death. Beware. You are joining Jesus' antagonists and refusing to hear what He says. Saint John, who records this exchange, would beg you at this point, "Little children, love one another," yes, in the love of Christ alone, which comes through faith in Him. Jesus said to them, "Truly, truly, I say to you, before Abraham was, I am." Christ Jesus is indeed greater than Abraham; He is the Lord God Himself, I AM. He created Abraham. He called Abraham to faith, and led Him to Canaan. He spoke His promises to Abraham, and blessed him to believe them. "And it was credited to him as righteousness." But there you are. There is the difference between Abraham and the Jewish leaders challenging Jesus. Abraham heard the Word of the Lord and received it in faith. These men in the Gospel reading do not have faith. They reject the Lord and His Word. They would have more trust in any of their self-sacrifice, than in Jesus Himself. And now here you are. The Lord has not tested you, telling you to sacrifice your only son. He has not miraculously provided a baby when you were a hundred years old. But He has poured out His Holy Spirit, that you may have the same faith as His servant Abraham. Jesus has made you a child of God in Holy Baptism, and it was credited to you as righteousness. He speaks His Gospel week after week, and you receive it in faith, and it is credited to you as righteousness. He nourishes you with His Holy Eucharist, and the Bread of Life is credited to you as righteousness. Through these Means of Grace, the Lord, I AM, makes you His own, that you may keep His Word and never see death. He removes all guilt of trusting in yourself, and closing your ears to the God of Abraham. He cleanses you from the iniquity of thinking Jesus is inferior, to Abraham, the prophets, or anyone, for that matter! He gifts you with faith, and credits it to you as righteousness. Yet even as you are sure and certain of what Christ Jesus has done for you, He is veiled in this world. Veiled in Word and Sacrament, Christ comes to you with forgiveness and life. Veiled, the glory of God renews and restores you. 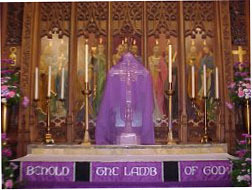 There is an old Lutheran tradition to veil works of art, including crosses, statues, and paintings during the last two weeks of Lent. A cloth covers these images of Jesus, reminding us of how God comes to us, veiled in human flesh and blood, to save us. Christ Jesus is God, veiled in the flesh, for you. He reminds you today, "Before Abraham was, I AM." And He has endured all suffering and death for you, so that you may never die. Amen.